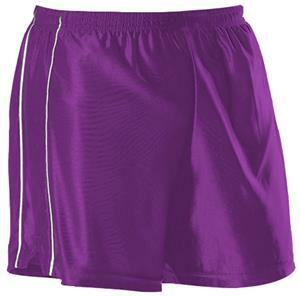 Alleson 553PW Women's Dazzle Softball Short-Closeout. These shorts are constructed of 100% nylon DAZZLE cloth (white is 100% polyester DAZZLE cloth). First, I did not wear these for softball. I used them for regular working out. They are longer in nature, so good for wearing sliding shorts underneath. The material is satin. The royal blue is very pretty. They are about the same cut as other softball shorts or basketball shorts. The material seems a little stretchy, which is good for movement. As for sizing, I usually wear a women's small. I ordered a medium. The fit is good for me, especially if I were to wear sliding shorts underneath. Perfect fit for my daughter, keeps her fresh while practicing.